3B Theater: Gonzoid Cinema: Harum Scarum! Trust us. We won't let this happen to you. "I'm in love with your daughter. How could I possibly assassinate you?" We open on a damsel in distress, staked out in front of hungry leopard. Enter, stage left, our Arabian hero, who quickly works his kung-fu on the guards. And then -- with only one deathly chop! -- he takes out the leopard and thusly saves the day. With the hard part done, our hero then serenades the girl while freeing her ... And the end credits roll. Nope, and not so fast. What we've just witnessed was the climax of Johnny Tyrone’s latest cinematic epic, Sands of the Desert, which is a much better title than Harum Scarum. 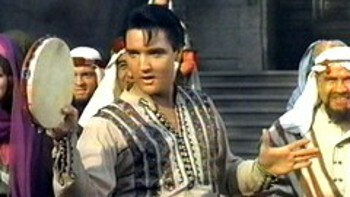 I mean, seriously ... Anyways, at the request of the American government, the studio agreed to hold the world premiere of the film in Abulstan and threw in a personal appearance by Johnny (Elvis Presley) to help improve U.S. relations with this Middle Eastern country. And after the American Ambassador thanks everyone for attending, he asks Johnny to sing a song, which he gladly does. 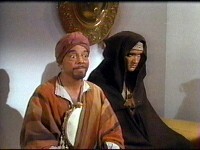 (I was kind of hoping for his version of "Ahab the Arab" but, alas, I was skunked again.) Once the number concludes, the Ambassador introduces Johnny to Prince Dragna (Michael Ansara) and his curvy companion, Aishah (Fran Jeffries). They in turn invite the famous movie star to visit their secluded kingdom of Lunacan, that's beyond the Mountains of the Moon (-- and just left of the Burning Bush), and with the Ambassador’s urging, Johnny accepts their generous offer. Now all they have to do is get there. The journey itself will take several days, and after the first hard day of travel through the desert, the Royal Caravan makes camp for the night, where Aishah informs Johnny that no other westerner has ever entered Lunacan before, so to him, it will be like stepping back 2000 years in time. And as Aishah pours Johnny a cup of wine and starts putting the moves on him, we notice that several nefarious-looking black-robed figures are closing in on the camp, scimitars drawn. But turns out Aishah's wine is drugged, and when Johnny passes out the seductress orders the bandits to quietly gather him up and haul him off. In belated honor of the King of Rock-n-Roll's 75th birthday on January 8th, I decided it was finally time to take a look at his less than stellar film catalogue. 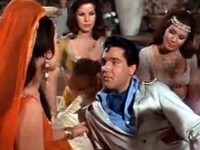 And since all efforts to track down a copy of Tickle Me or Change of Habit failed abysmally, I had to settle on Elvis’s Arabian Ka-Niggets adventure, Harum Scarum, for our first foray into his finely fractured film career. It’s almost a forgotten fact but from 1960 until his Comeback Special in 1968, Elvis Presley never performed live or went out on tour -- at all! Apparently, after Presley got out of the army in 1960, thanks to Colonel Parker's wheeling and dealing with the likes of Hal Wallis and Sam Katzman, his music career took a backseat to his film career. And unfortunately, while Presley was making films like this and Kissin' Cousins, the four lads from Liverpool took over the pop charts and the King soon found himself quickly sliding into obsolescence on the music scene, and worse yet, being demoted to Court Jester on the big screen as his film career didn't fare much better. All in all, Presley made 28 films from 1960-1969, almost three a year, and you can easily see the drastic downward curve in quality and the toll they took on their star if you chart them out. And a career that started out promisingly enough with Love Me Tender and King Creole, crashed and burned and augured deep into the earth by his last film, Change of Habit. Harum Scarum came right in the middle of all that. And despite a brief glimmer of hope with the likes of Flaming Star and the previous year's Viva Las Vegas, where the talent on both sides of the camera were evenly matched, by the time the Colonel had cemented another three picture deal with MGM for 1965, it became readily apparent that Viva Las Vegas was a fluke and it was back to the usual combination of slapstick and a song every seven minutes. And here, notorious industry skin-flint Katzman was in charge of this particular fiasco, and just like with his other cinematic turd-burgers, with his usual corner-cutting, blunt script-excising, and two-week shooting schedules, the project was basically doomed from its conception. But the biggest logistical hurdle for Harum Scarum came when Katzman almost lost his star after he took a gander at the script. You see, it was also around this time that Presley got himself a new hair-dresser and spiritual advisor in Larry Gellar, and so disillusioned and internally lost was Presley at this point in his life that he was ready to chuck it all and join a monastery, just like his former co-star Delores Hart, who had turned her back on Hollywood and became a cloistered nun in 1963. With Gellar as his guide, when Presley went through a self-described "spiritual cleansing" and tried to clean up his act, the battle lines were soon drawn between the new guru and the rest of Presley's family and entourage, who were content with the status quo and didn't appreciate the waves -- New Age or otherwise. With everyone's encouraging, Gellar included, Presley soon abandoned the idea of becoming a priest and honored his contract with Katzman -- and, all good karma aside, I'm sure the million dollar payday had a lot to do with the decision. Reuniting with director Gene Nelson, who had helmed Kissin' Cousins, filming commenced on the recycled sets of an old Cecile B. Demille epic, with costumes co-opted from Kismet, and props pilfered from Lady in the Tropics, and things only went downhill from there as we pick up the review with Johnny being persuaded at the end of a whip helmed by one of Sinan's goons. Prince Dragna, meanwhile, returns to the Royal Palace in Lunacan and reports to Toranshah, his brother the King, that his caravan was raided and their American guest was kidnapped by the notorious Assassins. Fearing that Sinan is up to something no good, Dragna encourages his brother to hide out until the danger has passed. Toranshah (Phillip Reed) agrees and will retreat to the summer palace as soon as the Fast of Ramadan is over, but, for her safety, sends his daughter Shalimar there right away. Once more Johnny awakens in the harem, where one of the girls treats his back that was whipped bloody. Then, from out nowhere, out pops Zacha -- con-man, coward, comedy relief, and Johnny's new best friend. Asked for his help to escape, Zacha (Jay Novello) only agrees after Johnny promises an ample enough reward to overcompensate for his inherent cowardice ... That night, during the changing of the guards, they escape the compound, but since Johnny refused to kill the guard the alarm is sounded. As they split up to lose the pursuing Assassins, when Zacha says to meet him at the Pool of Omar later, you, like me, are probably wondering how the heck is Johnny supposed to know where that is? Whatever. Anyways, after eluding the guards by scaling a large stone wall, Johnny falls into a pond on the other side. When he surfaces, Shalimar (Mary Ann Mobley) greets him from a floating gazebo. Apparently, Johnny had the good fortune of climbing into the royal summer palace, but for some reason, Shalimar hides her royal heritage and tells Johnny she’s just a slave girl. And while listening to his sob story of how some dope named Sinan kidnapped him, Shalimar is smitten by the American and agrees to take him to the Pool of Omar. Turns out these romantic feeling are mutual, too, because Johnny’s already offering to take Shalimar back to Hollywood, and she thinks they just might be able to convince her "master" to let her go to America with him. And by the time they reach the Pool, he’s swooning her with a song, and then they kiss -- extendedly ... Eventually, they come up for air, and when the Princess asks Johnny why Sinan kidnapped him in the first place, he offers they wanted him to kill an "important figure" in Lunacan. Naturally, Shalimar automatically assumes this to be her father, panics, and then takes the horses and rides off, leaving a dumbfounded Johnny behind. When the girl makes it back to the palace she warns her father of Sinan's plan, prompting the King to sends Dragna and the Royal Guard to roust out the Assassins. Back at the Pool of Omar, Zacha finally shows up, and since there are only two passages out of Lunacan, and knowing the Assassins will be watching them both, the cowardly thief realizes the only chance of getting Johnny out of the country is to disguise him as a performer in his troupe of dancers and musicians -- all he has to do is pass an audition first [Eye Roll] ... After introducing Johnny to his ensemble, we then get an extended belly-dancing sequence as three of Zacha's daughters shake their booty and tambourines all over the town square. As Johnny soaks it in, Zacha reveals they’re mostly a distraction so his midget, Baba (Billy Barty! ), can sneak among the crowd and pick some pockets. Wasting no time, Johnny takes up a tambourine and introduces Lunacan to a little rock-n-roll. Somewhat amazingly, the crowd is pretty receptive until someone catches Baba stealing a coin sack, and then all hell breaks loose. As Zacha's group scatters, Johnny is left to kung-fu his way out of the kasbah. Getting some timely help from a couple of street urchins armed with slingshots, these young ones also lead our boy to a secret lair inside the Palace of Jackals. Turns out these urchins are Zacha's children, too -- in truth, orphans that he took in. Johnny's pleased to meet them, but all he really wants is to find Shalimar and get the heck out of Lunacan. With that, the whole troupe begs Johnny to take them back to America, too; and when one of the little orphan girl steps up, swearing she can pull her own weight, and starts to do the hully-gully, Johnny gets such a big kick out of it he starts serenading her. (She’s a little young there, E.) And after a wild night of singing and dancing, the gang hits the sack ... Alas, the evil Aishah wakes Johnny up in the morning, and he discovers the place is filled with Assassins. Thinking Zacha has sold him out, Aishah lets the cowardly thief off the hook, revealing they’ve been following him since his escape. She also demands that he obey Sinan and kill the King, or all the orphans will die. Meanwhile, at the palace, Shalimar is dreaming of Johnny, and as his reflection sings to her from the royal bathtub, her handmaiden enters and comments that the Princess has the look of love about her. Confessing her love for the American, Shalimar fears she will never see him again. Hell, he doesn’t even know she is a Princess because, if he did, they never would have gotten past first base. (So that’s why she never told him.) When the Royal Guard returns empty handed, the Captain warns the King that a traitor in the palace must have tipped the Assassins off, meaning they’ll have to be doubly careful. Hey! Anybody seen Dragna lately? Also of note, the celebration marking the end of Ramadan has arrived; and as a familiar dance troupe entertains the Royal Court, hiding under a hooded cloak, Johnny lurks in the background. (Wait? Whoa ... Elvis was a Jedi?) As Zacha whines that his friend must kill the King or they’re all dead, when Johnny approaches the throne, Shalimar recognizes him and screams a warning. 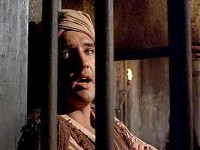 Caught, Johnny swears he only wants to talk, but the entire troupe is seized and thrown in the dungeon. The next morning, the alarm sounds and the Captain of the Guard reports to Dragna that the King is missing, and his royal bed is torn apart and covered in blood. As Dragna orders him to search the city, Johnny, Shalimar, Baba and the King sneak into the Palace of the Jackals but discover the Assassins have already beaten them there and have recaptured the entire troupe. As they secretly watch, when Sinan receives word that the King is dead he then demands payment from the man who hired him. And it isn't much of a surprise when Dragna comes forward and settles up for services rendered. Ah, but the evil assassin then pulls a double-cross, informing Dragna that he will only be a puppet ruler and Sinan will be the one calling the shots -- it seems Sinan's made a deal with some foreign company to exploit Lunacan’s untapped oil reservoirs. And if Dragna refuses to be his puppet, they will just kill him, too. When he agrees to keep his head, Aishah takes the Prince back to the palace to keep an eye on him. And since Zacha's people know too much to live, Sinan orders his men to kill them all. With that, Johnny comes to the rescue and gets the head assassin in a chokehold. Ordering Sinan to call off his men or he'll snap his neck, the villain capitulates but warns that none of them will ever make it to the safety of the palace alive. Zacha, however, assures that he has plenty of friends and relatives who will fight for the King -- for the right price. Throwing Sinan into a handy cart, the small group rolls out into the darkened streets of Lunacan, where, using a variety of signals, Zacha rousts out his army of thieves. As they make their way to the main square and stake Sinan out, the other Assassins attack and a nasty street fight erupts. Between blows, Johnny tells the King to take cover, but he refuses, and with his trusty scimitar, heads off to the palace to find the treacherous Dragna. Then, with all the deadly drama of an old Keystone Cop short, the massive fight eventually peters out when Sinan is accidentally killed by one of his own men. Without their leader, the other Assassins are quickly routed and victory belongs to the good guys. Marshaling their forces, they head to the palace to help the King. But when they break into the throne room, they find him and Dragna locked in a deadly game of -- chess? (The hell?) To explain, the King tells Johnny that even though Dragna is a traitor, he’s still his brother, and so decrees the Prince and Aishah will be banished to the nether-lands, and Lunacan will open official diplomatic channels with the U.S. of A. With that, we quickly switch venues to Las Vegas and the premiere of Johnny Tyrone’s new musical show -- and he’s brought Zacha and his entire troupe to America to be part of his revamped act. In the audience, the King and Shalimar look on approvingly, Zacha is having no luck with the slots, while Baba is cleaning out the house. When the last number ends, Johnny heads out into the audience, where he and Shalimar kiss. So, How bad was Harum Scarum you ask? Well, it was so bad that even before it was completed Colonel Parker took Wallis to task and demanded that he fork out more money to get their cash-cow some better material. And after screening the first rough-cut, Parker blew up again and suggested that Katzman add a talking camel to narrate the film, then perhaps they could save it as a comedy because as an action and adventure yarn yawn, the film was basically unsalvageable. This spurt of conscience was short lived, however, evidenced by the films that followed. When filming wrapped, Presley gave director Nelson an autographed picture with the inscription: "Someday we'll get it right." Alas, this prediction never came to pass. Still in the midst of his spiritual makeover, Presley doesn’t appear to be too enthused about the production and, rather obviously, was just going through the motions until they wrapped for the day so he could return to the Self-Realization Retreat with Gellar and continue his journey to get in touch with himself. If you look real close, you can spot Memphis Mafioso Red West as one of the Assassins, and I wouldn’t be surprised if a few more were hidden behind all that Arab greasepaint. The rest of the supporting cast don’t embarrass themselves, and it was just weird seeing Billy Barty that young. And as an actress and former Miss America, Mary Ann Mobley makes a fine former Miss America. Also of note, the film's abysmal soundtrack was recorded before filming even began, and when I calculated it out, there's a song approximately every 7.2 minutes -- all of them as forgettable as the film itself. 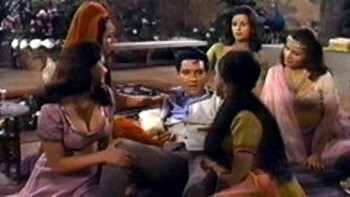 Though Mary Anne Mobley would later appear in Girl Happy, her co-star in that vehicle, Shelley Fabres, holds the record for co-starring with Elvis on three separate occasions: Girl Happy, Spinout and Clambake. One co-star he didn't have was Barbra Streisand, who wanted the aging rock star to be in her 1976 remake of A Star is Born. This was scuttled by the Colonel, who publicly felt his boy wasn't right for the part but privately asked for too much money, which is why the role went to Kris Kristofferson. Knuckled-out by Chad Plambeck: misspeller of words, butcher of all things grammatical, and king of the run on sentence. Copy and paste at your own legal risk. Questions? Comments? Shoot us an e-mail. How our Rating System works. Our Philosophy.